This is my home page its for Greenwich Rabbit Rescue. This is a small rescue centre based in SE London [the largest in numbers] I take in unwanted rabbits and g/pigs with a view to rehome them. If you are thinking about taking on a pet then I would ask you to think very carefully about it before you take the plunge. Have you the time? Can you afford the vet bills? Rabbits need injections twice a year. Do you know how long your pet will live? Are you taking the responsibility for your pet? Children lose interest, so what happens then?. These are things to think about. Last year there were 33 thousand rabbits rescued. If you have a heart then please think about that and the idea of giving one of these unwanted animals another chance of a happy life. We run in conjuction with The Animal Samaritons.I am totaly none profit making.Money coming in is spent on running cost, cages ect. If you do not read any further then please remmeber rabbits need hay , water, food, daily attention. The best pairing is male and female [ the boy castrated]. If your pet stops eating or drinking get to a vet. MUSIC CAN BE TURNED OFF ON ANY PAGE BY CLICKING BUTTON AT THE BOTTOM OF PAGE. This is us, not a huge place but a safe temporary home for the rabbits. Accommodation is two very big sheds, and a few outside cages. We normally have indoor & outdoor cages for sale/ second hand. INJECTIONS FOR RABBITS: There are two, one is for myximatosis and the other for VHD.Myxi jabs are twice per year if you live in a high risk area. VHD is a yearly one. I strongly suggest you get both done. There is now a new VHD2 injection needed as well..G/pigs do not need any injections. Getting you rabbits spayed can cost between £60-100, castration £50-100 depending on your vet. Rabbits, like many other animals, find winter tough. They do not hibernate and they will rely on their owners for survival. Even though Mother Nature will supply them with a warm winter coat, a little extra thought will be needed. These tips will help your readers help their pet rabbit, Britain's third most popular pet. Bedding must be clean and dry at all times. Wet bedding could freeze! Keep an old towel for your rabbit and gently dry him if he gets unexpectedly wet. Rabbits do not like draughts, especially at night. If his hutch is outside, make sure it is fitted with a rain and wind proof cover for bad weather and night time. It should hang down over the front but it should allow a little air for ventilation. However, a rabbit will thrive with its hutch outside or in a garden shed, even in harsh conditions - no need to bring the hutch into the living room! If the hutch has an outside run onto grass or concrete, close it off until spring arrives. Rabbits like a little greenery in their diet but make sure that they are not frosted or frozen when given to your rabbit - this could easily result in a fatality. Best keep foodstuffs in your kitchen so they stay at room temperature. Your rabbit's water should be kept free of ice at all times. Don't allow it to freeze.Add a small drop of cooking oil to the water,and in very cold weather put an old sock over the bottle, this will help to stop it freezing. Diet need not be necessarily altered but rabbits do like a lot more hay in the winter as an extra..Even when winter seems very quiet for wildlife, foxes and vermin are still busy and extra hungry. Make sure that your rabbit's hutch is secure and safe. Always make sure that your rabbit has fresh water by replacing it in the morning and evening. Make sure your rabbit has shade to rest in. Put a umbrella over the hutch. Take extra care with cleanliness - in particular keep the toilet area of your rabbit's hutch clean so the flies have little to interest them. Again, to discourage flies, keep the rabbit's eyes, nose and 'vent area' (bottom!) clean and free from mucus or droppings. Do not totaly reley on such things as rear guard to protect your bun from flystrike. Extra grooming will not only make your rabbit feel more comfortable but will help deter flies. Frozen water bottles can be put in the cage for the rabbits to snuggle up to to help keep cool. Ceramic tiles laid in the day part of the cage are always cold to lie on. Fly netting can be put over the mesh, this will stop the flies getting into the cage. As mentioned, it is vital to the health of your pet to provide an exercise area where your pet can roam for a few hours every day. The easiest way to accomplish this is to buy a rabbit run or, use fencing panels sold for dogs. These can be found at most pet stores. Buy fencing that is at least three feet high for small and medium rabbits and four feet high for giant breeds. These panels are easily put together with metal pins and can be configured to any size or shape needed. The pen keeps your bunny away from furniture, electrical cords and toxic materials. The pen can also be used outside as a moveable enclosure to allow your pet access to grassy areas. Never leave a rabbit outside in a pen unsupervised, because dogs, cats and foxes may be able to knock down the fencing or climb over it and harm your rabbit. If you need to protect the floor under the pen you can use a sheet of no-wax flooring which is available at most hardware stores. It can be easily cleaned and rolled up when not in use. If you are going to allow your pet free access to your house you need to bunny-proof it. Block all escape routes, cover or block access to electrical, phone and computer cords, cover furniture to protect it from the rabbit's teeth and claws and remove access to toxic plants, insecticides and other toxic materials. Pelleted litter makes the best bedding and is preferred over wood shavings, corncob and kitty litter. Pelleted litters are non-toxic and digestible if eaten, draw moisture away from the surface keeping it drier, control odor well and are can be composted. Do not use clay or clumping kitty litter. We have had cases where rabbit ate these products and died from an intestinal impaction. There are a wide variety of litter tray beddings available through pet stores. The ancestors of our pet rabbits would have spent a good portion of their day in protected burrows underground. 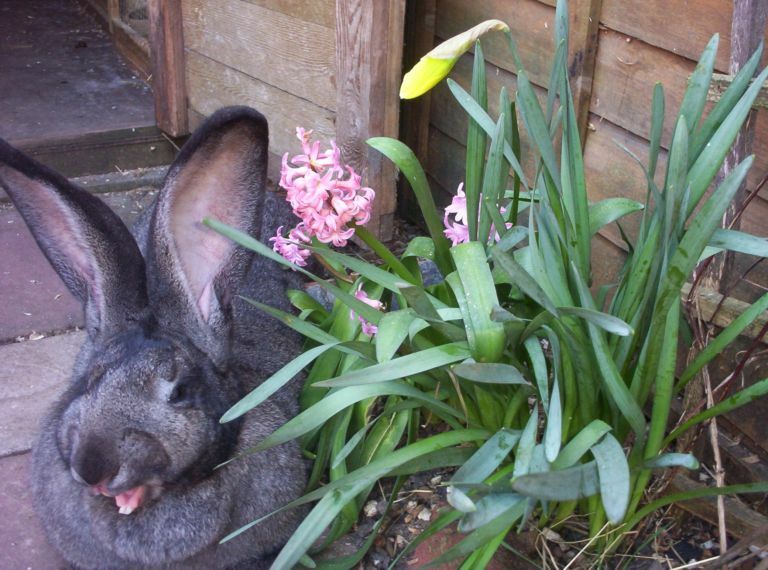 Our pet rabbits retain the same need to have a protected area in which they feel safe and secure. Some rabbits are content to sit in a box full of hay, others like a completely enclosed box in which to hide. Try providing untreated wicker or straw baskets, litter pans or other shallow boxes filled with hay, cardboard boxes with an entrance hole and the bottom removed or large cardboard tubes as places to hide. Use your imagination! . Use material that is washable or disposable and absorbent. Some examples might be fake fleece (not long fur) found in sewing stores or absorbent baby blankets (not terry cloth towels). Do not use carpet squares because they are not absorbent, they are abrasive to the feet and they can not be thoroughly cleaned. WHY DONT WE JUST LET THE RABBIT GO? Our domestic rabbits are handicapped in other ways. Their light coloring makes them very visible and they are easy pickings for a predatory dog, cat, hawk, owl, fox or human. A loose rabbit can be hit and killed by a car. Many domestic rabbits do not know to get in out of the rain, stay dry and avoid getting chilled. Cold temperatures combined with rain can chill the rabbit and lead to pneumonia and death. Because our domestic rabbits have adapted to a captive feeding schedule they often don't feed between dusk and dawn and hide during the day as wild rabbits do. They have not developed the lightning speed reactions they need to make a hasty escape from a predator. If a male/female pair of rabbits live long enough to have a litter then a population explosion may occur. Eventually the increased population could force the rabbits to seek more territory. They may invade surrounding neighborhoods, eating prized garden plants and irritating people to the point of poisoning or shooting the rabbits. A domestic rabbit turned loose may survive for a short time but will probably eventually fall prey to injury and/or illness. His life might not end peacefully and he might experience considerable suffering in the process. Of course, the former owner will be long gone and will not have to witness this sad ending. Myth You can let an unwanted rabbit go in a field and it will be fine, fending for itself. Lots of people ask me if that is what we do with our culls. The thought horrifies me, to think what that poor bunny goes through in its last day(s). The Truth: Domesticated rabbits, once released into the wild will, in most cases, quickly become food for the local predators, whether they be dogs or cats or, if you live in the country, hawks, eagles, coyotes, etc. If they survive the predators, released rabbits still have to face a gauntlet of disease, poisoning, and starvation. Contrary to another popular myth, rabbits do not instinctively know which plants are safe to eat and which ones can be dangerous to them. Although they do retain many of the "prey" instincts, domesticated rabbits have never had to rely on those instincts to survive, and they honestly have no clue as to what to do. Myth Rabbits can live on just carrots, lettuce, and cabbage. A million non-rabbit people I know think this is true. The Truth: Just like people, rabbits require a balanced diet of vitamins and minerals as well as proteins and fiber. And just like people, they simply cannot survive on a diet limited to just two or three items, especially if one of those items is basically nothing but water (iceberg lettuce). The easiest way to provide for a rabbit's nutritional needs is to find a feed dealer who sells a good quality rabbit pellet. Then you can add the carrots as a treat. Myth A rabbit can be picked up by its ears. Ouch! The Truth: A rabbit's ears are not a handle. Try having someone pick you up by your ears if you want to see how it feels! The proper way to pick up a rabbit is to scoop it up, supporting its body with both hands. This myth was popularized by the outdated image of magicians pulling a rabbit out of a hat, and many still believe that is the way to handle rabbits. Magician societies of today strongly discourage picking up a rabbit by the ears. A big no-no! The Truth: No one is quite sure how this myth got started. One possibility is the rarity of actually seeing wild rabbits drinking. Another explanation is that wild rabbits' diet of fresh greens is filled with moisture, so rabbits don't appear to need water. But domestic rabbits on a dry, pelletized feed absolutely requires fresh drinking water. Without it, they won't eat. I think this "no water" myth came about as a result of misunderstanding. European countries with severe winters commonly give ice to their rabbits, rather than water, and which then led to the saying "rabbits don't need water." It's a myth that all pet store bunny treats are good for your rabbit...most are just junk food. The Truth: Most of the fancy pet store treats sold for rabbits are actually meant to be visually appealing to the person buying them. The dried, sweetened fruits and nuts included in these feeds can make a rabbit obese as well as cause digestive problems. Perhaps the worst myth out there is that baby bunnies are weaned and ready to be sold at three to four weeks of age. So many people think that because rabbits are eating solid food at that age that the rabbits are ready to be away from mom. The Truth: This is probably one of the myths that upsets the reputable breeders the most. A baby rabbit of only three or four weeks still requires its mother's rich milk even though it may be nibbling solid food. Forcibly weaning it this young can cause serious problems later. Weaning at four weeks of age is strictly for the commercial rabbit meat grower and only under controlled conditions! A rabbit and a hare are the same thing. The Truth: Hares differ from rabbits in that they don't dig burrows and their young are born more mature. Rabbit young, or kits, have a gestation of approximately 28-31 days. They are born naked and blind and require a period of time to grow in a safe nest before they can run. The hare, on the other hand, is born after a gestation of approximately 42 days. The young, called leverings, are born fully furred, eyes open, and they are ready to run immediately after birth. You can't necessarily tell a hare from a rabbit just by its common name. The jackrabbit is actually a hare and the Belgian Hare is actually a rabbit. Talk about confusion! The Truth: Hares (Lepus) have 24 pairs of chromosomes while the domestic rabbit (Oryctolagus) has 22 and the cottontail (Sylvilagus) has 21 pair. While mating is possible between the different species, the resulting embryos will die after a few cell divisions because of the differences in the number of chromosome pairs. The Truth: So many non-rabbit people are amazed when they come into our rabbitry and hear some of our bunnies make that excited, happy-to-see-you sound. It goes from sort of a buzzing noise to real chatter. Rabbits make a wide variety of sounds from the contented "purr" of a happy rabbit to the shrill scream of a rabbit in fear for its life. The size a rabbit will become as an adult depends upon the size of the cage. If that were true, many people with house bunnies would have mammoth rabbits! The Truth: The size of a rabbit entirely depends on the breed(s) of its parents and its genetics. The Truth: No, it is the people who do not clean the cages often enough. Rabbits will normally go in one corner of their cage and can be litter-box trained. Due to the fact that the rabbit is a "prey" animal, it instinctively keeps its home clean to prevent a build-up of odor that would reveal its location. When confined to a cage, rabbits usually will pick one spot in the cage and will continuously use it as their "potty" spot. Observant owners can watch this potty spot to help keep track of their animals' health. This myth might have its origins in the Bible, where rabbits are considered to be "unclean," like pigs. Deuteronomy, chapter 14, verses 7-8 says, "However, of those that chew the cud or that have a split hoof completely divided, you may not eat the camel, the rabbit or the coney. Although they chew the cud, they do not have a split hoof; they are ceromemonially unclean for you." (Different versions of the Bible will have it worded slightly differently.) Of course, we all know now that a rabbit doesn't chew cud but, back in Biblical times, they didn't have the extensive knowledge of animal biology that we do now. Rabbits cannot survive outside in the cold of winter. The Truth: It was only last year that I found out that rabbits can usually survive fine outside in the winter (unless they get wet or if the temperatures are far below freezing, in which case they will require additional protection). Most rabbits have nice thick coats that keep them warm, except for the hairless oddballs that pop up from time to time. Netherland Dwarfs are nasty-tempered and unsuitable for children. The Truth: There are a few evil-tempered ones, but then again that is true for any breed! Just like any other pet, a rabbit lives as it is treated. A rabbit that is handled gently and carefully will be a happy rabbit and a joy to handle. A rabbit that is treated roughly will be a frightened rabbit and will respond in kind. The breed of the rabbit bears little influence on how it develops. Every rabbit with long hair is an angora. Breeders don't care for their rabbits. The Truth: With the exception of the commercial grower, there is little profit, little prestige, little tangible reward in raising rabbits. So why do people do raise them? Simply put, they love the little guys. Most breeders put the welfare of their rabbits above anything else. I even know breeders, myself included, who put the welfare of their rabbits ahead of their friends and families. They have special pets in their herds who are spoiled rotten. Myth Rabbits are "dirty" creatures. The Truth: There are other long-haired breeds, such as the Jersey Wooly and the American Lop , cashmire lop. The Truth: This is a common line that people use, which seems to make them think that rabbits are easy to breed and raise to adulthood. I know I was very disappointed when first starting into raising rabbits. Nothing was really easy. I had many things to learn to be successful. All rabbits are easy to breed regardless of breed. The Truth: There are several difficulties with breeding most of the smaller breeds. I've met young people who purchase a pair of dwarfs, expecting them to produce "like rabbits." Many factors are involved in producing a live litter, which most people don't realize. The Truth: A doe rabbit that is used to being handled won't object to her owner handling her kits in most cases. But on occasion, you do find the over-protective mother who doesn't want anyone touching her kits. Each rabbit has to be considered individually. The mother will curl up with her babies in the nestbox and keep them warm all night. The Truth: As part of a prey species, a doe rabbit actually spends very little time with her young. This is to help prevent detection of the kits by various predators. She builds a nest of grass, hay, or straw, pulls fur off her chest and belly to line it, then leaves her kits in the warm, cozy nest, except for feeding them once or twice in a 24-hour period. A doe's milk is among the richest in the animal kingdom, which allows the infrequent feedings. Myth A doe can be successfully bred only during the first two years of her life. The Truth: A lot of does are still capable of having litters up until they are six years old. When I first started breeding dwarfs, I rarely kept a doe past age two. I now have several does that I breed who are between five and seven years old. Myth All albino rabbits are deaf. The Truth: There is nothing to substantiate the belief that white rabbits are deaf. A rabbit's color is set by a specific set of genes that has nothing to do with its hearing. Bigger rabbits are the better pet for children. The Truth: I have both, large and small breeds. I think the dwarfs and minis are considerably better pets for kids! A large rabbit can be intimidating to a child. If a child is intimidated, he or she won't want to pay attention to the rabbit or take care of it. However, the smaller breeds can be held easier and are much less difficult to take care of (for a child). This is what I have noticed over the years with my own children and many others. There are treasures of good temperament in all breeds; sometimes it just takes a lot of looking to find them. Small rabbits are easier to hold; large ones are great to curl up with on the floor and read. I remember a two-year-old girl at one of my first shows who had a huge English Lop...she just hauled it around like a stuffed toy, and it let her. It's temperament that counts! All rabbit breeders are evil, nasty people who are mass-producing rabbits in an already over-saturated market to make money, money, money! The Truth: Raising rabbits is an expensive hobby. Buying stock, feed, cages, equipment is a constant outlay of funds. And there isn't a whole lot of money coming in. Cash prizes at shows are small. To sell show stock, you have to show, show show (spend, spend, spend!) and win, win, win to develop the reputation to command decent prices for your youngsters. The market for pets is notoriously cheap as most pet stores want six to eight week old kits and want to pay only £5.00 for them. A reputable breeder simply refuses to deal with the pet market that is willing to abuse their babies just for the sake of a quick buck. But like kittens and puppies, there will always be those out there who do run petfarms . Extensive prosecution hasn't stopped the kitten/puppy farms ,and it hasn't stopped the bunny farms either. Most reputable breeders, if they learn about a bunny farm ,will report it in an effort to get it closed down. But for someone to allege that a rabbit breeder is into raising rabbits for the money would be ludicrous if it wasn't so pathetic! I wish someone would show me where the profit is in raising rabbits 'cause I've been losing money on them for the last nine years! Raising rabbits for me, and I dare say most breeders, is a labor of love. All people who buy rabbits know what they're getting themselves into! The Truth: I can't say how many phone calls I have gotten lately from people who have bought rabbits from me and who now have questions about bunnies and the weather - too many to count! I even sent these buyers home with a pamphlet on rabbit care and a membership form to the BRC ., and at the time they acted like it was going to be so easy to take care of their new rabbit(s) and that I knew nothing! Many parents say they want to get a rabbit for their child to teach the child some responsibility. What usually happens is that the child loses interest (not to mention being incapable of sticking to a routine and providing proper care), and the rabbit suffers. The child, at best, learns to feel bad that she has failed and caused suffering. At worst, she learns to resent the animal for the nagging that she is hearing from the adult. Often, the rabbit is given away because "you didn't take care of it". The child learns that life is disposable and that if she waits long enough, someone else will relieve her of her "responsibility'. So, let your child help with the rabbit, but don't insist. If the child appears interested, encourage her; if she becomes bored, let her move on to the next thing, and you carry on with the rabbit. She learns most of all from watching you-your actions, your tone of voice when you speak to the rabbit, and your attitude. From this she learns the nurturing (responsible) point of view- the patient waiting, the faithful caring, the joyful appreciation and acceptance of a living creature for who it is, not who you wish it to be. When taking on any animal there are things you will need. Firstly, there is the accommodation. Are you going to keep your rabbit in the house? If so, you need an indoor cage - as big as possible. If indoors, then there is bunny-proofing to keep in mind. Rabbits will chew, so precautions have to be taken, mainly for the wires of phones, tvs and computers. Indoor plants can also be lethal to rabbits, so they need to be placed out of the way. A litter tray is needed, and you will need to litter-train your rabbit. Water must be available at all times, as well as a food bowl and hay rack. Hay is very important and should always be available. It is best put in a rack, as when it is trodden on it won't be eaten. Woodshavings are useful for the cage floor, there are other products that can be used, but shavings are very absorbant. Salt licks are favoured by many rabbits. Avoid the treats that can be tempting from your pet shop as they are not good for the teeth. Some rabbits enjoy toys, but some don't, so don't buy lots at one time in case you have a rabbit that can't be bothered. You don't have to spend a lot of money on toys - favourites can be plastic flower pots or empty toilet rolls. As rabbits like to chew, fruit tree branches are usually liked and apple tree branches are the best. Rabbits like to strip the bark of the branches and it's great for their teeth. If your rabbit is to be an outside bunny, then you will need a hutch. This again should be as large as possible - no smaller than 4 foot and larger if you have two rabbits. A run for the patio or lawn is necessary, but never leave the house and leave your rabbit in its run. Foxes will tip runs over or dig underneath. The hutch should have proper bolts as the ones provided on the cages are not good enough and are easily opened by foxes. Don't place your cage in direct sunlight as your rabbit will get too hot, the best place is in a shelter out of the sun. If you have foxes about, then one idea is to make a wooden flip-down cover for the doors of the hutch. This is just a piece of plywood that is hinged at the top of the hutch and can be flipped down at night and secured at the bottom. This will keep foxes from getting at the wire mesh. A piece of tarpaulin is handy for rainy or windy days. For bedding - again wood chips are best. You will need to put a good layer in, as your rabbit will be in the hutch for many hours if you are at work, and you don't want him standing on a hard floor. You can put straw in the winter and, of course, a hay rack water and bowl. For feeding the best rabbit food is a complete one, so your rabbit cannot pick and choose what bits to eat. Buy one that is low in protein and high in fibre. Vegetables can also be given, but slowly at first if your rabbit is not used to it. Guinea pigs are different and they thrive on veg of all kinds including fruit, and they must have a special guinea pig mix, as it has extra vitamins that some guinea pigs cannot store in their bodies (mainly vitamin C). Nails must be checked monthly as they grow, depending on how much wear they get. Don't forget rabbits have two jew claws on their front feet, like dogs, and these need watching as they will dig into the leg if left. 020 8319 0283 [ Val] or email: greenwichrescue@aol.com Please ring anytime im here most of the time.Sunday is the only day i may not be here.